AC Input of 110VAC. Dual Outputs of +5VDC @ 1.5Amps & +24VDC @ 3 Amps... 80 Watts Over Current protection, Over Voltage Protection, LED Output indicator. DIMENSIONS: 6.25" length, 3.875" wide, 1.625" high ..
AC Input of 220VAC. Dual Outputs of +5VDC @ 1.5Amps & +24VDC @ 3 Amps... 80 Watts Over Current protection, Over Voltage Protection, LED Output indicator. DIMENSIONS: 6.25" length, 3.875" wide, 1.625" high .. The higher Voltage/Amperage power supply is used to give the stepper motors the power they need to move quickly and repeatably without loosing the commanded steps. Power Supply: $85 (Part Number PS-110-36V-200W) (MFG# CL-A-200-36) AC Input of 110VAC. Dual Outputs of +36VDC @ 5.6 Amps ... 200 Watts Over Current protection, Over Voltage Protection, LED Output indicator. DIMENSIONS: 7.875" length, 4.375" wide, 1.9" high .. The higher Voltage/Amperage power supply is used to give the stepper motors the power they need to move quickly and repeatably without loosing the commanded steps. 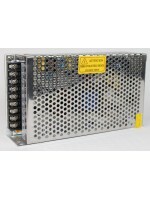 Power Supply: $85 (Part Number PS-220-36V-200W) (MFG# CL-A-200-36) AC Input of 220VAC. Dual Outputs of +36VDC @ 5.6 Amps ... 200 Watts Over Current protection, Over Voltage Protection, LED Output indicator. DIMENSIONS: 7.875" length, 4.375" wide, 1.9" high .. The higher Voltage/Amperage power supply is used to give the stepper motors the power they need to move quickly and repeatably without loosing the commanded steps. 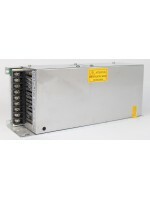 Power Supply: $95 (Part Number PS-110/220-36V-400W) (MFG# CL-A1-400-36) AC Input of 110 or 220VAC. (selector switch) Dual Outputs of +36VDC @ 11 Amps ... 400 Watts Over Current protection, Over Voltage Protection, LED Output indicator. DIMENSIONS: 10.2" length, 4.1" wide, 2.6" high ..